Anyhoo, I tried Stitch Fix last spring and loved 4 out of my 5 items, 2 of which became my favorite summer wardrobe essentials! I received 2 tunics, a dress, a pair of maternity leggings, and a pack of three camisoles! My favorite item was the cream and orange tunic. Since it has 3/4 sleeves, it’s just warm enough for most fall/winter days here in Texas, especially with your own personal oven keeping you toasty. I’m NOT a model. And my 8 year old was the one taking pics of me (which she really did quite splendidly, but “a flattering angle” isn’t really something I could ask her for), so ya know, give me a little slack…these pics are just to show you guys what the clothes look like. I’ve worn this dress ALL THE TIME, dressed up or down. It’s short-sleeved, so I’ve typically worn at least a thin, drapey cardigan with it, and often some leggings as well. It’s super stretchy, as is everything in this fix, so it fit me well in my first trimester (I’m wearing it in the pics I took for my Facebook page), and seems like it will last me all the way through the final weeks! It’s a smidgen low-cut for my tastes, but since I have the camisoles as well I just throw one under and it solves the problem. The cami 3 pack came in white, black, and cream, and they’re super soft and stretchy, and nice and long, so they gave me a little leeway in wearing non-maternity shirts for awhile after they would otherwise have been too short. 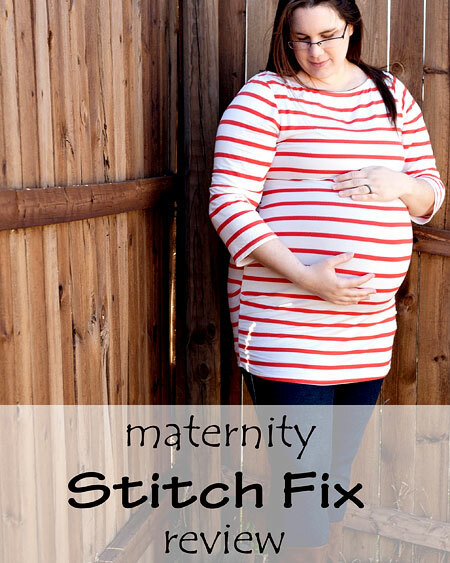 The final top from my maternity Stitch Fix is this fun blue one! I really love how cute my baby bump looks in the top…to the extent that it’s actually now vying with the first tunic for my favorite maternity item! It’s short-sleeved, too, so I generally layer it. That said, we’ve had some really warm days these past few weeks so I’ve been wearing the top by itself with the leggings and my favorite Toms. So…yeah. I loved everything my stylist picked for me! In fact, if you’ve seen me during the last 6 months, unless you were at my house and I was therefore in my jammies, I’m pretty sure I was wearing one of these tops. 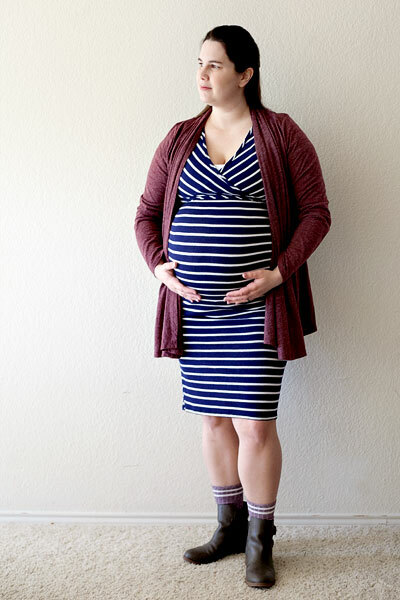 I literally just added a couple more pairs of maternity leggings, bought a few super soft non-maternity cardigans of varying warmths to layer with, and that’s been my capsule maternity wardrobe. So…yeah…you should totally follow my affiliate links to sign up for Stitch Fix (or get the Moms in your life a Stitch Fix Gift Card for Mother’s day, just saying). It’s a total win-win situation…you get awesome clothes, I get to buy myself more Stitch Fix awesomeness! Or, you know, you could just do it because you get to try on fun new clothes in the comfort of your own home, and send back whatever you don’t love with no shopping stress — yayness! It all looks great on you! Love Stitch Fix!! I love all of those photos. Your 8 year old did great. My oldest is almost 5, so I have feeling I would get a lot less flattering photos. I loved all of your items though.